Many people will instantly associate the word “wealth” or “wealthy” with money. However, true wealth is not about money. It is about freedom. Some people think if they were to stumble across a large sum of money, it would completely change their circumstances. If I could just win the lotto, I could quit my job, still pay the bills, and have a financially secure future. It is important that we become aware of these feelings and find our spending triggers. We need to recognize the difference between our desires for the instant gratification from certain purchases (like impulse buys) and indulgences (like eating out too often) versus the things that will give us long-term happiness because they allow us to feel free – financially and otherwise – but rarely provide any short-term satisfaction. Some questions to ask yourself include do you feel guilty after buying it? Is it a purchase you might hesitate to tell your partner about? Are you trying too hard to justify the purchase when making the decision? If you answer yes to one or more than these, that may be your sign that your short-term and long-term goals are at conflict and you need to think about this decision longer. Take this scenario: treating yourself daily to a $5 Starbucks caramel macchiato, or upping your 401K contribution to include that $150/month you’d be spending on that coffee – what feels better today? Let’s be honest, the 401K might make you feel responsible, but probably not very excited and maybe even reluctant or like you missed out on something. You think to yourself, it’s just a coffee; I have done such-and-such to deserve it. You might also justify that you don’t have enough extra income right now, but when you make more money in the future, you’ll save more for retirement. In ten years, that daily coffee may feel more like a habit more than a treat and you’ll realize that extra contribution to your 401K would have grown to a total of more than $38,000 after 10 years. After 20 years, $114,000. From there, the exponential growth would continue just from reducing your daily expenses by $5/day. (This assumes a realistic 50% match on these 401K contributions by your employer and a 7% annual rate of return.) What will feel better then? Giving up the instant gratification day to day can be difficult if we don’t keep our eye on the long-term prize. In the case of investing versus spending, one provides satisfaction in the short-term and one in the long-term. One is a reward we can see now and the other (investing) often isn’t – unless you invest in additional real estate or other tangible assets. The ‘better’ won’t materialize for a few years so it can require more effort to invest in (but I promise it will sneak up on you way faster than you would expect). It’s easy in principle and we’ve all heard it before, but why can investing long-term in ourselves be so hard to do? Our first attitudes toward money were learned as children by watching our family. Those impressionable opinions and attitudes probably began to form when we learned to count. How did they feel about their finances? Were they constantly stressed and stretching beyond their means? Did you learn to base any of your measure of self-worth on material goods your family possessed? Was spending on vacations, dinners, and entertainment carefully budgeted and planned for or more of a last-minute splurge to reconcile later? Or maybe they instilled the importance of hard-earned money, saving, and good financial decisions by giving you an allowance and letting you choose how to spend it. Later in life, we also adopt the habits and lifestyles of those we associate with and spend our time with, so also look around you. Most of us have deep-rooted attitudes about money (good and bad) of which we were unaware. These attitudes can be hard to break, but becoming aware of why we may feel certain ways about money and how we feel compelled to spend it is a huge first step. So is acknowledging that even if your income suddenly doubled or was cut in half, these rooted attitudes you have toward money would not change, and how you spend it probably wouldn’t either. Eventually, you’d feel just as rich or as poor as you did before, so simply having more money is not the answer. You can probably think of a scenario where this proved to be true. Have you or someone you know ever received a raise or a bonus, and then quickly adjusted your own lifestyle to match the new amount? Maybe the lump sum seems to have just disappeared or, if it was a raise, you still have the same amount of expendable income at the end of the month. Where did the money go? For many, when their income increases, their discretionary spending increases equally. Those who are thrifty with a little will still be thrifty with a lot; those who spend carelessly with a little will spend carelessly with a lot – and odds are it won’t make you feel better. The same is true for the opposite effect. If you or someone else were to experience a decrease in their monthly income, you would find ways to decrease your spending or reduce your bills. You would have no choice! Various surveys have estimated the percentage of Americans living paycheck to paycheck may be between 42% to 76%. For many of these people, there always seems to be just barely enough money to get by, but just enough. I think this speaks highly of the powers of our logical reasoning, motivation, and resourcefulness to meet our goals once we make them. And if no goals or budgets have been set, then the default goal becomes a very generic, “have enough money for everything I need.” With no concrete guidance or definitions on ‘enough’ or what exactly constitutes a ‘need’, no wonder this can make one fall back into harmful spending patterns in the moment. So, how does one break this cycle and build wealth? The first step is quite small and simple, but incredibly impactful. Commit to invest 10% of everything you earn. Anybody can downsize their spending, their lifestyle, their budget by 10%. If it sounds like a lot as a lump sum, remember it’s only $0.10 for every $1.00 you spend. Humans are incredibly resourceful – you will find a way to make it work and, more than likely, not feel the impact of that “cut” too much. Once you commit to invest the 10%, automate it. Set up your direct deposit so that 10% goes to another account and don’t even think about touching it unless it is to invest it per your investment strategy. 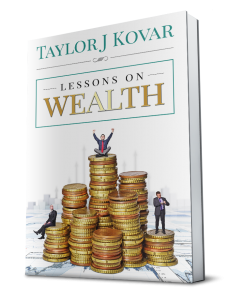 In my book, Lessons on Wealth, I introduce this concept as the first of my three Guidelines of Wealth: Get, Grow and Guard. Investing 10% is part of the ‘Get.’ That is your money so make it work for you; don’t pay it to someone else. for whatever a man sows, this he will also reap." He will provide all that you need. Have faith in that to invest in yourself and invest in others. So, we’ve committed our 10% to invest in ourselves and perhaps another 10% or so to our church and/or our community. Let’s talk about how we can make better decisions about the remaining 80%-90% that we have. According to psychology, it’s a real thing. Each of us has a limited capacity for the number of decisions we can make in a day, big and small. Our logical decision-making power depletes as the day goes on so any decisions made at the end of the day may be met with little to no willpower. This means there are factors that play into your motivation successes and failures beyond your control, so having a goal like, “I will make better spending decisions” is too vague. It is so important that you plan a categorized budget and give yourself rules and a template to follow, to guide your logical decision-making process for discretionary spending within your budget categories. (We’ll talk more about this later.) Money does not make you powerful and having “too little” money does not make you powerless. There are no excuses for not planning. Remember that millions of dollars are spent a year on consumer research to understand your spending triggers. Businesses are investing in research to find out what makes their customers buy, and how to coerce (and dare I say trick) you into buying more stuff, more often. With loyalty cards that track your spending and email subscriptions that report back which email subject lines get you to open the email and then which links in the email you click on, this is highly sophisticated stuff. The scary thing is they probably understand our shopping habits and impulse buy decisions more than we do. Even Facebook ads are carefully curated and targeted to YOU based on the pages you like, the emails you receive, and your web browsing history. It knows what things you window-shopped on Target and placed in your cart but didn’t buy, and might remind you of those items while you think you’re harmlessly catching up on your Facebook friend’s lives. You need to be mindful and prepared for this sneaky advertising on social media, in emails, and on websites. Congrats! The first and perhaps the most difficult commitment is done! Next, we will discuss creating and sticking to a budget for you to allocate that remaining 90%.